In 1998, when I was 18, I became a certified Advance Open Water diver. This led me to the path of experiencing, exploring and teaching the world which a few of us know – the underwater world. Right after completing my certification, I saved up money to buy scuba equipment. Later on the following year, I applied to a Dive Master course which I completed successfully. In 2002, I decided that the sea is where I want to be, and diving is what I want to do. I enlisted in a Scuba instructor course. When I was certified I was thrilled and quickly did my stage, and shortly after “jumped into deep water” (literally), and started to teach diving on regular basis. I certified over 300 students in the Open Water, Advanced Open water and Nitrox Divers programs. 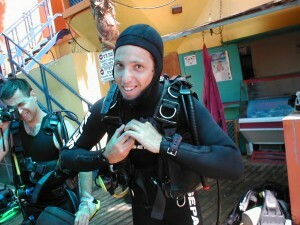 I extended my specialty to Breath Hold Diving (Apena Diving), and I am also a TRIMIX Diver. To all the readers: I hope that you would learn to love the sea as much I do and do it as much as you can. Also I hope that while doing so, you’ll respect the sea God Neptune, and consider the environment and above all dive SAFELY.